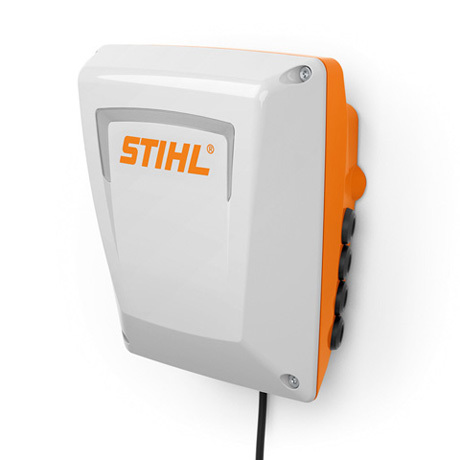 The STIHL GCI 100 automated watering controller lets you reduce water consumption in the garden by up to 50%. The STIHL GCI 100 Smart Garden Hub responds to current weather data in real time and adapts the water supply to rainfall or other influences. The STIHL GCI 100 is the perfect complement to almost any existing watering system, making it future-proof. The hub can be operated anywhere and anytime via the free app thanks to the integrated WLAN interface. It has been specifically optimised for interaction with the main smart home and smart garden applications, including the iMow software. This lets you easily coordinate watering with the mowing times of the robotic mowers. A sturdy, sealed housing protects the hub from the weather and offers enough space to connect all cable lines. The internal transformer makes installing the STIHL GCI 100 as uncomplicated as its makes organising watering your garden.